It is christmas and the new year 2015 is around the corner. Some of you are following me on twitter, but even there not much has been happening lately. I have been very quiet for a long time. Not that there wouldn’t be anything interesting to tell you. You can write almost about anything and make it sound interesting. I just haven’t been really into tweeting “just did an awesome bikeride” or “just had a tasty lunch at Kempinski” or something similar. I mean, who really cares about that. So I have not had any great ideas and no subjects to write about lately. I am just an ordinary person now. How boring does that sound! Let’s make this text a bit more interesting. In a year a lot can happen and let me review the year a bit. I was working with an awesome group of female bike riders here in Qatar during springtime. I planned the cycling program for Aspire for the girls multi sports department. I gave a UCI cycling coaching course in Dubai where 30 ladies learned how to coach. I spent a month in Switzerland at UCI’s hedaquarter and became a UCI Diploma Cycling coach. We are going home for Xmas! I am looking so much forward to go cross country skiing. There is not that much snow in Black forest, but with a little bit of luck it will snow on Thursday. I am checking the weather forecast all the time and hoping the temperature curve will stay under the 0 degrees line. This means snow! The biathlon stadium on http://www.notschrei-loipe.de should have artificial snow, so skiing will be possible. Yeah! Bummer, I have an injury. A couple a weeks ago I was out stand up paddle boarding (SUPing). First I thought my hip got really tired from it and the muscles became sore. This soreness never really disappeared and the complete knock out was last Friday when I did a 10km run. After 3km I should have stopped because of the pain, but as a former athlete and a person who never gives up I continued. The result from this is now complete rest and some voltaren. As many of you know the Worlds in cycling road racing is taking place in Doha in 2016. Qatar is hosting another big sport event. Qatar has a men’s team, they have boys, but until now there has not been any girls riding their bikes. This has now changed. As some of you might remember, the cycling federation started a project last spring. Our goal was to get a group of girls who wants to ride their bikes. We have now reached the next step of the project. We have a group of 10 girls and training can start. Cycling has been my life and it is my life and now I can share my experience and knowledge to these girls by being their coach. Qatar’s national team coach. Keen for some mtn biking? 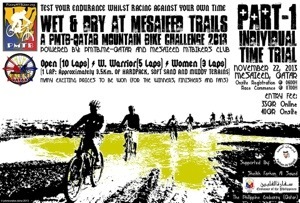 22nd of November the Philippino MTB community is organizing a MTB TT in Mesaieed. Start is at 7am. Have fun out there in the desert folks! The sport of triathlon has arrived in Doha! It is about time. UAE has come a bit further when it comes to organizing sporting events, but Qatar is doing really well now. With GMC Triathlon Series (4 events during this winter) and the first ever Marathon, which will be held on 10.1.2014, all leisure time athletes will have a goal to aim for. I was quite happy about my running. It felt very good and I had a good 3’45” pace. If you want to have a look at the results, here they are. After doing 2 triathlons and 1 aquathlon I start to know Doha’s triathlon community. It is very international with people from all over the world. I like this as you can learn so much from other people and other countries.